HAVANA, Cuba (CNN) -- Sharp jabs and crushing body blows echo across a boxing gym in downtown Havana. A fighter takes a breather between rounds at Havana's "Kid Chocolate" Boxing Hall. Teenage fighters pummel each other in the sweltering Caribbean heat inside Kid Chocolate, the famous Cuban boxing hall named after its pre-revolution world champion. "I've always wanted to box since I was little," boxer Jose Antonio Dominguez said, breathing heavily after winning a come-from-behind stunner in a series of regional bouts. A veteran at age 16, Dominguez -- like many Cuban youths -- has trained since he was 10. "I wanted to be an Olympic champ, and that's still what I want," he said. "I'm not going to stop until I get there." Cuba has earned 32 gold medals in Olympic competition since 1972, second only to the United States. But it withdrew from the 2007 World Championships in Chicago, Illinois, over fears of defections that developed after two of its fighters deserted during the 2007 Pan-American Games in Brazil. 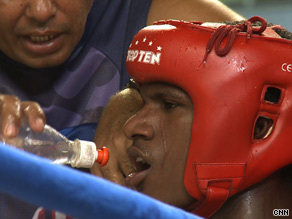 On Wednesday, Cuban boxers joined over 70 fighters from 13 countries in competition. They vied in the preliminaries of the American Elite Championships being held this week in Mexico City, Mexico, according to an International Boxing Association (AIBA) statement. "By all counts, the Cubans have gotten off to a good start," AIBA spokesman Richard Baker told CNN, noting three wins that Cuban Olympic medallists Yankiel Leon Alarcon, Roniel Iglesias Sotolongo and Emilio Correa Bayeux racked up in their first day of preliminaries. With the United States choosing not to participate, many analysts see the bouts as a testing ground for Milan in September. Following a disappointing performance at the 2008 Olympics in Beijing, China, where Cuba left without a single gold medal, the island nation has focused on developing new talent. "It's a rebuilding phase," Baker said, adding that many of Cuba's world champions have recently left amateur boxing to pursue greener pastures. Million-dollar contracts have lured away Cuban athletes for years, drawing top baseball prospects like Orlando "El Duque" Hernandez and Jose Contreras away from the promise of state salaries at home. Two-time Olympic boxing champion Guillermo Rigondeaux -- the latest in a string of defectors -- is now winning professional bouts in Las Vegas, Nevada. Despite defections, Team Cuba still managed to earn twice as many Olympic medals as its closest opponent in Beijing, bringing home four silver medals and four bronze. The next closet competitor was China, led by lightweight phenomenon Zou Shiming, with four medals in total. The small Caribbean nation of just over 11 million people has raked in more World Championship gold medals than both the United States and Russia. "Cubans have the whole package," Showtime commentator Nick Charles told CNN. "They have the aggression ... the technique ... the athleticism." Banned in 1962, professional boxing gave way to amateur competition in Cuba that has routinely produced world champions. "It's a very rigorous process," Charles added. "It really started many years ago, after the Soviets were there in the '60s to implement the sound technical foundation that these fighters needed." The apparent rigor of that system and keen eye for young talent keep Cuban trainers like Emilio Rodriguez prowling school yards for the next top prospects. Some analysts say it may take more to produce world champions, though. "A boxer is a mischievous person," Rodriguez added. "When a mother says, 'He's a bad kid' -- that's who's going to make a good boxer."